Here is our weekly report. After the NEO token builder release, many users tried to created NEP-5 tokens on our platform. However, token contracts are not enough for the crowdsale process. This is a key process for the entire blockchain industry, and that is why we are continuing our development. On the 18th of June, we have planned to launch our Crowdsale contract with NEO’s blockchain. We would like to thank NEO for their continuous support. Ability to change the dates of Crowdsale contracts after they have been deployed. This feature was requested by many users, and is planned on being released on the 18th of June. 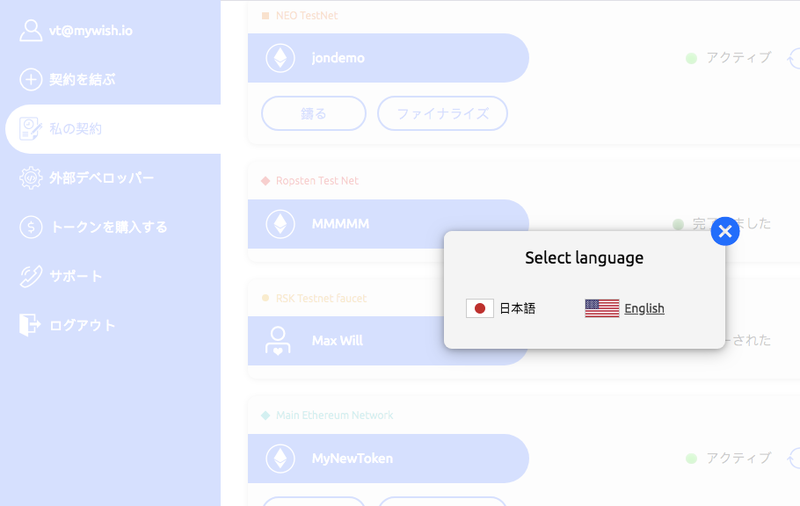 On the 7th of June we are launching our Japanese localization with the intention of adding Chinese next. EOS integration is on-going and will come to our platform without a doubt in the near future. Cardano (ADA) integration is currently being discussed with Cardano team. Airdrop/Whitelist contracts are planned, but no release dates yet. We have been getting a lot of offers from small exchanges, but they are lower in daily volume than IDEX or Cryptopia. Therefore, we are continuing negotiations with big players such as KuCoin, Bitfinex, and Binance. Alexandr and Valeriy will be attending the Blockchain Community Summit in Moscow on the 23rd of June. While attending the event they will be discussing the different opportunities of blockchain technology, and the potential of smart contracts for personal/business utilization. The next conference we plan to visit is the Blockchain Summit in London on the 26th and 27th of June. While there, Valeriy will speak about blockchains, smart contracts, and how to use both in personal/business aims. The MyWish team will be presenting in the exhibition area with a stand, and will be encouraging guests to get involved in the process of Smart Contract creation. On the 27th of June, Vladimir will be discussing the same topic that Valeriy did in London at the Blockchain Expo in Amsterdam. As with our previous Summit attendances, there will be a stand present and we would like to meet as many people as possible while there. We have written and translated press release into Chinese, which discusses the integration of MyWish & NEO. Now, we are sending out this press release to Chinese crypto media sources. We are also searching for bloggers who discuss smart contracts on a fluent and proficient level. We plan to try using this marketing channel to provide MyWish with a higher level of recognition. We have concluded the application process for the Ambassador Program for MyWish. Our team would like to say a formal thank you to all of the participants for their interest and initiative. We received a lot of applications, and are proud of the interest of the candidates. We will be taking some time to carefully examine the answers of each candidate before we announce the results. The anticipated date for the announcement of the results is the 13th of June.